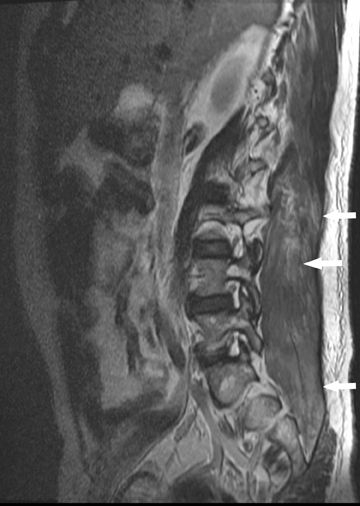 The MRI scan (Figure 1) revealed diffusely abnormal high signal on T2-weighted images with corresponding low signal on the T1-weighted sequences in the perispinal muscles. The muscle architecture was altered, and there was blurring of the margins between muscle bundles and an unsharp appearance to the contents of each muscle bundle. 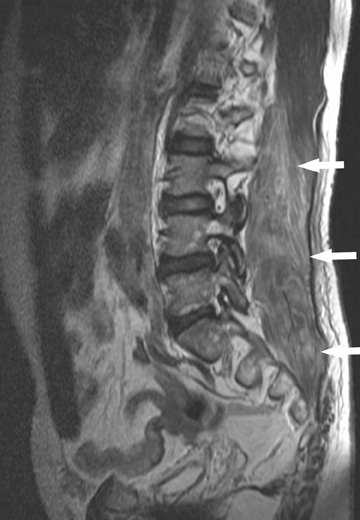 Small areas of confluent necrosis were also appreciated on the right (Figure 1). 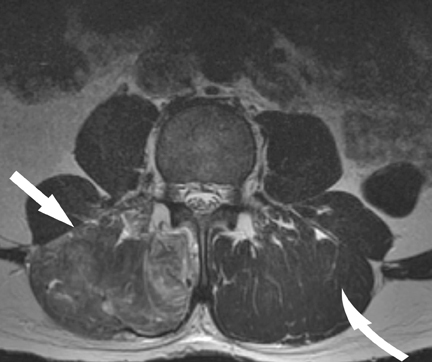 There was also abnormal enhancement diffusely in these muscles on postcontrast imaging (Figures 1). The other muscles were within normal limits. 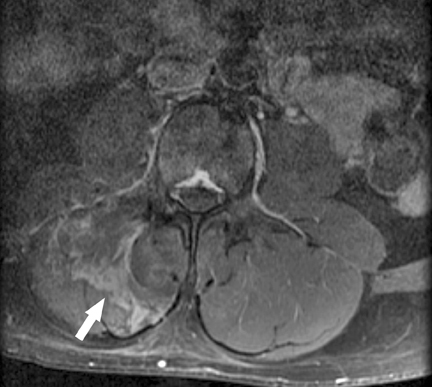 A follow-up MRI obtained one week later showed persistent signal abnormality (Figures 2); however, new areas of curvilinear T1 high signal appeared in the muscle, representing hemorrhage with loss of muscle architecture and more prominent areas of confluent necrosis. 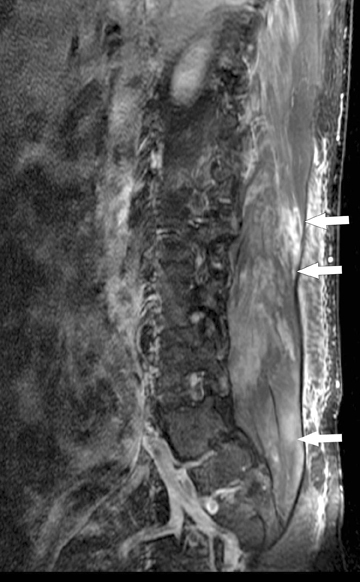 Enhancement was again seen and was only slightly decreased in prominence compared to the preceding study and the areas of confluent necrosis were clearly delineated (Figure 2). The abnormal signal in the left muscle complex had slightly improved in the interval. Rhabdomyolysis should be entertained in the sudden onset of muscle pain and/or acute renal failure, especially in the setting of cocaine use, severe exertion, and trauma. MRI findings are helpful in determining the presence of this entity, which can be confirmed by testing the serum for elevated CK levels. It is important to remember that up to 50% of cases may be silent, without accompanying pain or muscle weakness, and the MRI findings may be the only suggestion of rhabdomyolysis.1 Early diagnosis allows the institution to provide appropriate management, given the frequency of acute renal failure in such patients. Botempo LJ. Rhabdomyolysis. In: Marx J, Walls R, Hockberger R, eds. Rosen’s Emergency Medicine: Concepts and Clinical Practice. 6th ed. Philadelphia, Pa: Mosby Elsevier; 2006:chap 125. Brady HR, Brenner BM. Acute renal failure. In: Kasper DL, Braunwald E, Hauser S, eds. Harrison’s Principles of Internal Medicine. 16th ed. New York, NY: McGraw-Hill Medical Publishing Division; 2006:chap 260. Abraham B. Malignant hyperthermia susceptibility: Anaesthetic implications and risk stratification. QJM. 1997;90:13-18. Singhal PC, Rubin RB, Peters A, et al. Rhabdomyolysis and acute renal failure associated with cocaine abuse. J Toxicol Clin Toxicol. 1990;28:321-330. Welch RD, Todd K, Krause GS. Incidence of cocaine-associated rhabdomyolysis. Ann Emerg Med. 1991;20:154-157. Roth D, Alarcon, FJ, Fernandez JA, et al. Acute rhabdomyolysis associated with cocaine intoxication. N Engl J Med. 1988;319:673-677. Counselman FL, McLaughlin, EW, Kardon, EM, Bhambhani-Bhavnani, AS. Creatine phosphokinase elevation in patients presenting to the emergency department with cocaine-related complaints. Am J Emerg Med. 1997;15:221. May DA, Disler DG, Jones, EA, et al. Abnormal signal intensity in skeletal muscle at MR imaging: Patterns, pearls, and pitfalls. Radiographics. 2000;20:S295–S315. 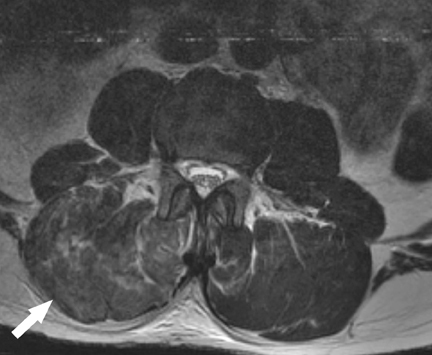 Kakuda W, Naritomi, H, Miyashita, K, Kinugawa, H. Rhabdomyolysis lesions showing magnetic resonance contrast enhancement. J Neuroimaging. 1999;9:182-184. 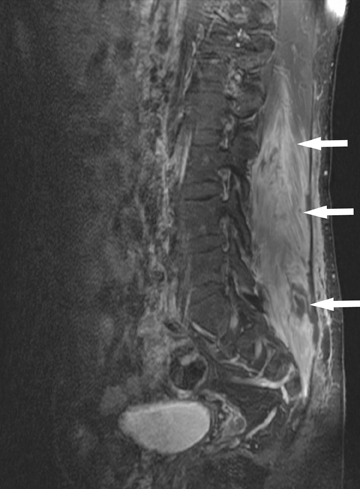 Stock KW, Helwig A. MRI of acute exertional rhabdomyolysis--in the paraspinal compartment. J Comput Assist Tomogr. 1996;20:834-836. Lamminen AE, Hekali, PE, Tiula, E, et al. 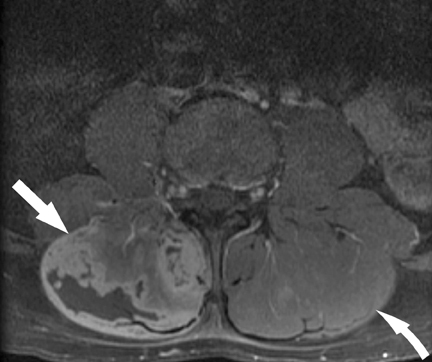 Acute rhabdomyolysis: evaluation with magnetic resonance imaging compared with computed tomography and ultrasonography. Br J Radiol. 1989;62:326-330. Cocaine-induced rhabdomyolysis with secondary acute renal failure. Appl Radiol.